IDENTIFICATION AND DATING: cca 1901 Humber Forecar ? 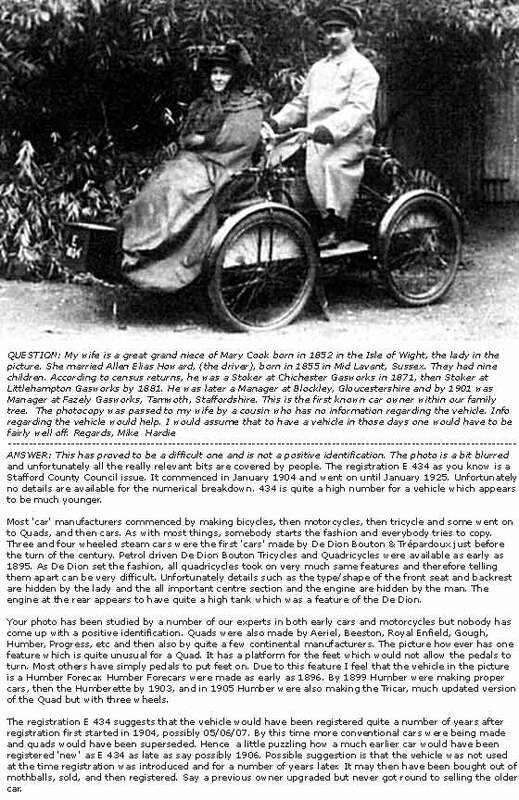 Photo received from Mike Hardie (UK) researching the family tree and coming across the first car owning ancestor, Allen Howard. Eventually in 1901 he was the Manager at Fazely Gasworks, Tamwoth. Vehicle was difficult to identify and this is not a positive identification. For further information please see photo. 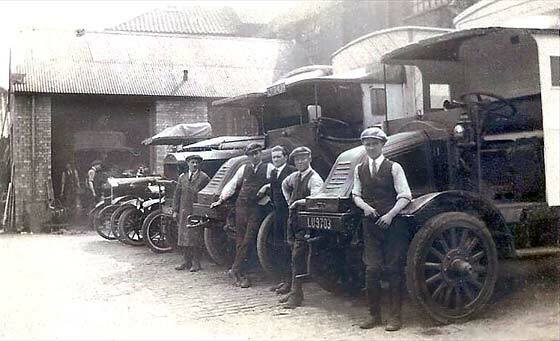 We think it is a cca 1901 Humber Forecar. The Stafford registration E 434 suggests that the vehicle was not used at the time of introduction of registration, so is probably older. 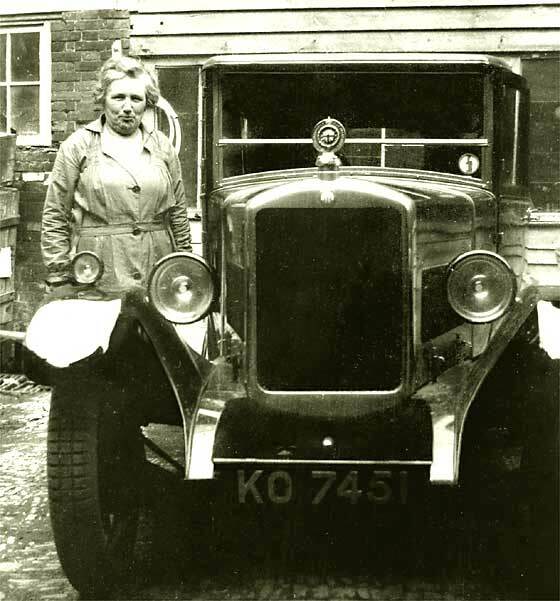 Couple of photos received from Martin Wade (UK) relating to his wife's Great Grandfather, Harry Rowland Harding of Leicester, one of the first car owners in the area and the Hon Treasurer of a local motoring club. A very unusual car which took some finding but finally confirmed by our Tim Harding as being a cca 1902 Parr 8 HP Tonneau manufactured by J. Parr & Co Ltd of Leicester. Transcripts of Leicester CC records advise that the car was registered on the 12. 12. 1903, - to a Mr. H. R. Harding. Photo received from Terry Broughton (UK), also connected with the enquiry above, of Dr Annie Cornall who was the daughter of his Great Great Grandfather. She was one of the first women registered medical practitioners, worked in India, and was a Fellow of the Royal College of Surgeons. The car is quite unusual being a cca 1906 Vulcan 10 HP Swingseat Tonneau, made in Southport. The front passenger seat swings round to give access to rear. Vulcan mainly made commercials. 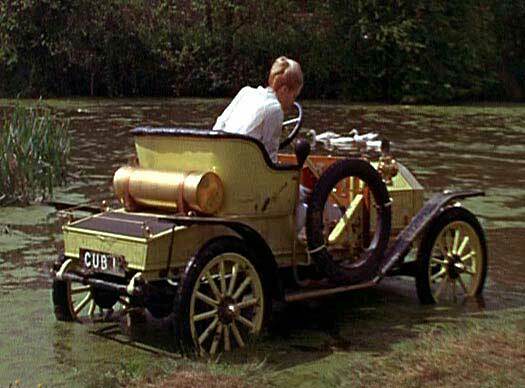 Photo received from Colin Green (UK) who is a fan of the 1968 film Chitty Chitty Bang Bang, and would like to know what type of car it is that 'Truly Scrumptious' drives in the film. The car may have been specially made. 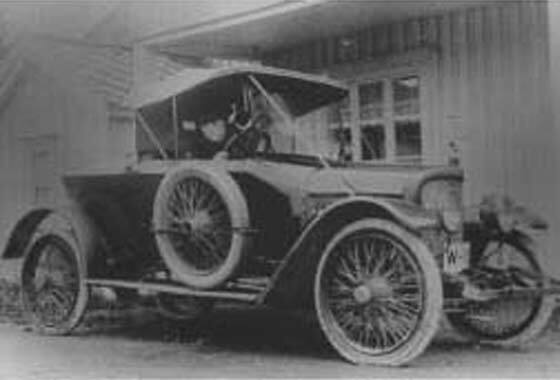 The photo shows a 1909 Humber 8. These were made only in 1909 and 1910. The CUB1 registration is a Leeds County Borough Council series issued in December 1935 and suggests that something was done to the car because the registration is not an original 1909 car. 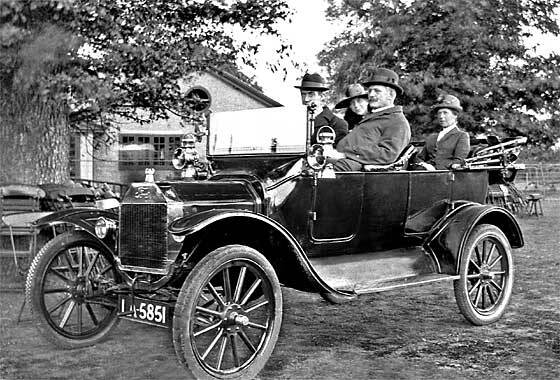 Photo received from Barry Edwards (UK) of his Grandfather in the front passenger seat, Grandmother left, of a Ford Model T possibly owned by the J. Lyons Company. He believes the photo was taken in the grounds of the J. Lyons Sports Grounds at Sudbury Hill, Middlesex, in about 1915. The registration LA 5851 was issued by the London County Council. The LA series commenced in April 1910 for cars at 3001 and terminated at 9800 July 1911. This would make LA 5851 mid/late 1910. 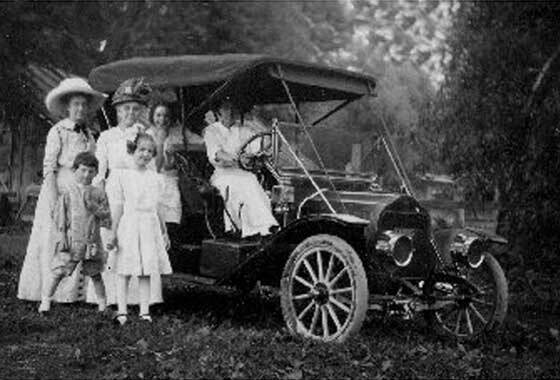 Fascinating 'period' photo received from Nancy Hunt (USA) showing her mother and uncle, and grandmother at the wheel. Photo was taken in Cleveland, Ohio about 1917. 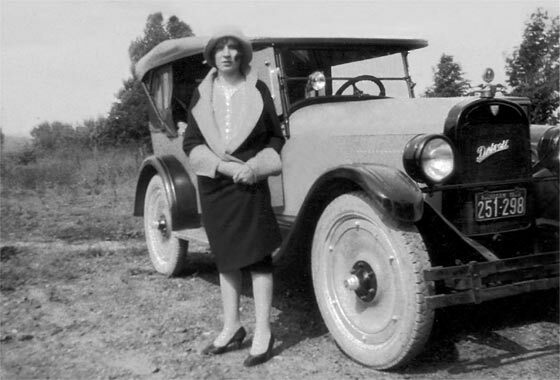 Granny was an intrepid driver, touring with mother and daughter from Ohio to Mexico in 1936 on rough roads. She often ran out of gas, and hiked to the Indian reservations to get more. This car is a cca 1911 Flanders 20 made by Everit,-Metzger-Flanders in Detroit (1909/12), stablemate of 'EMF' and distributed by Studebaker. Photo received from Gordon Beattie (USA) requesting year and make ID on the automobile (Buick?). It belonged to his grandfather who was a Buick dealer in Niagara Falls, NY, USA. Gordon's mother is writing an autobiography and wants to include the picture in her book. Sounds as if Gramps might have been a bit naughty because the car in the picture is a cca 1919 Dodge Brothers Model 3 !! There was a casual similarity between many US cars made during this period, but a Buick this is not ! A further interesting Photo received from Annette Hughes (UK) from her grandfather's collection. It shows a vehicle depot, possibly railway or removals, with some very unusual heavy vehicles for the UK. At first glance they look like Renault but Renault bonnets did not have louvers on the leading edge. It looked American. They are in fact 1919 Kelly-Springfield. Registration number of the nearest lorry, LU 9703, was issued by the London CC in April 1919, reserved for "Heavy Motor Cars". Photo received from Richard Weetman (UK) of his Grandfather Albert Weetman. The vehicle is a 1921 Seal made by Haynes & Bradshaw of Manchester 1912-20 and Seal Motors Ltd 1920-24. Very unusual three wheeler motorcycle and sidecar with all occupants seated in the sidecar, powered by 980cc JAP V twin engine. Registration letters in the photo are not clear; FB was Bath and FR was Blackpool, both 1921. After 1924 these were made for trade only as "Progress", up to 1934. 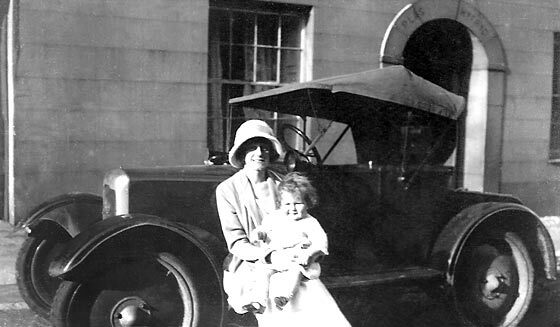 Photo received from John Govett (UK) which was taken by his wife's Grandfather in 1923-4 of his wife Gertrude and daughter Marjorie. The car was a much prized possession, as the family had only very recently started to prosper. The photo was taken on holiday in the Isle of Wight. Gramps was a trainee cinema operator who went on to build his own cinemas in Rawtenstall, and Haslingden. The car is a cca 1922 Rover 8, very popular (18,000) air-cooled flat twin 2-seater, made 1919 - 1924. Photo received from Dave Costello (USA) of his Aunt Margaret Costello. The car has a Michigan licence possibly dated 1928, and "Detrolt" on the radiator. Car was owned by her fiancé who had the reputation for flashy cars including a penchant for Jags. This is a cca 1923 Maxwell possibly Model 25. 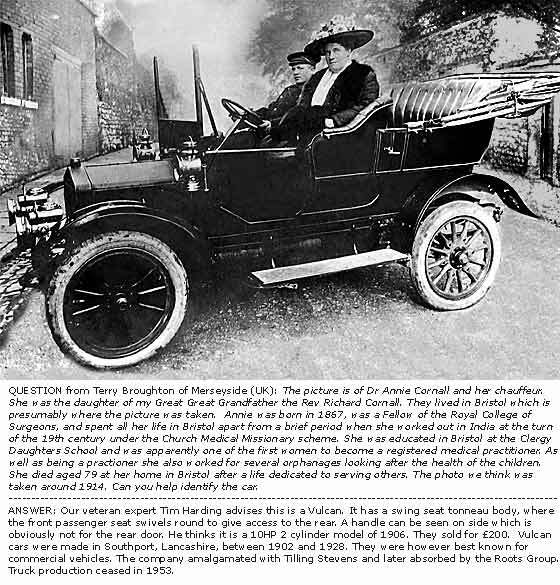 The "Detrolt" is in fact Detroit, a name started by Thomas-Detroit in 1906, who were taken over by Chalmers in 1908 becoming Chalmers-Detroit, and then taken over, in 1922, by Maxwell Motor Co.
Lovely photo received from Jonathan Lovejoy (UK) showing his Grandfather and his then fiancé, later his Grandmother. It was taken in North London. We can advise that it is a 1925 Royal Enfield 350. We can date the numberplate pretty accurately; YL was a registration issued by London County Council between July/November 1925. 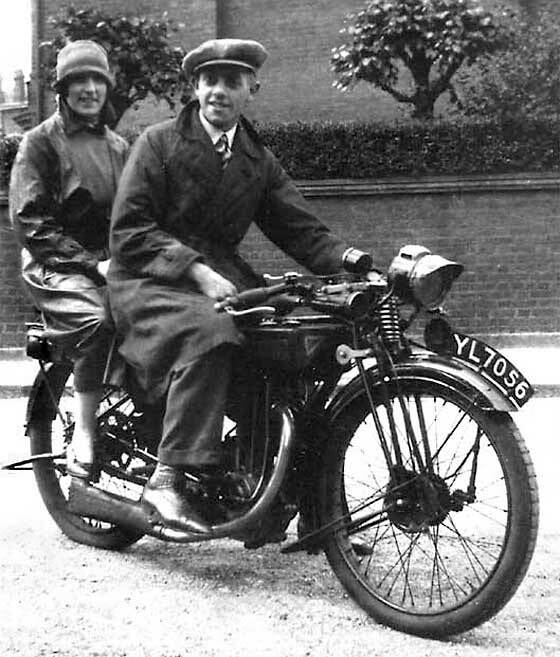 Our motorcycle expert Geoff Morris confirms that the motorcycle is 350 cc, OHV, and a sporty model, and lady's semi-cloche hat suggest photo from late '20s. One more of the photos received from Peter Daws (UK) which we have been identifying. This one is of a 1926 Amilcar CGS3. Registration BA6140 was issued by the Salford County Borough Council in 1926. Amilars were manufactured in France between 1921 and 1939 and this was a very sporty car indeed capable of 80mph even then. The car was designed by Edmond Moyet who was 'moonlighting' when he was being employed by Andre Citroen to design the famous Citroen Model C 5CV. 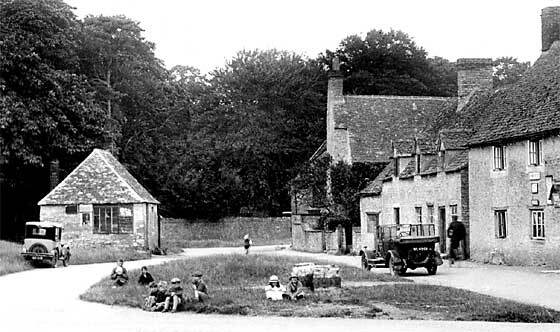 Photo received from Bob Hessian, Chairman of the Bicester Local History Society (UK) of a rural scene in Oxfordshire. He is trying to date the unused postcard and wondered if we could tell from the registration number of the car on the right, WL 4961. Yes we can. The WL registartion was issued by County Borough Council of Oxford in early 1928. The car on the left is a 1928/30 Austin Seven Top Hat Saloon. The one on the right could be a Morris or Standard. Not enough detail to tell. Photo received from David Hindle (France) who has recently purchased a property in Central France which has been vacant for 48 years; some kind of family feud. 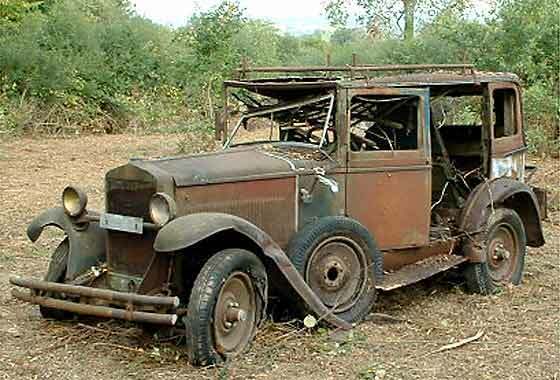 There he found a car, which he headed 'Peugeot', which is absolutely complete but has a lot of rust damage. Wasn't Peugeot; we thought it was Italian, possibly a 1928 Alfa Romeo 6C but were subsequently advised it was a 1928 Fiat 521C. Valuation in this sort of condition is what you can get for it; lots more if it had been Alfa. One of a number of photos received from Peter Daws (UK) which we have been identifying. This one is of a 1928 Hillman 14 Saloon, having a 1954cc sidevalve engine. 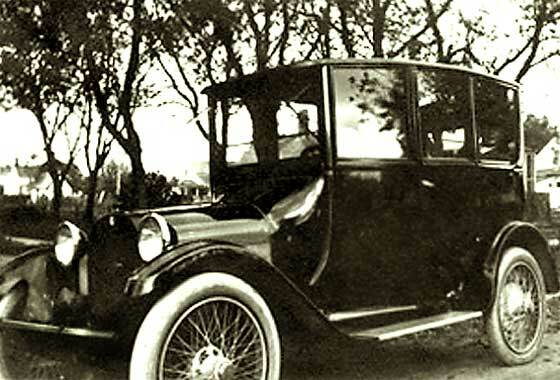 About 11,000 of these good quality cars were made between 1925 and 1930 with various body styles. The price was £345 when an Austin 12 was costing £455. The car was registered KO 7451, which was a number issued by Kent County Council in Maidstone. KO series regn. commenced in February 1927 and finished in May 1928. Photo received from Malcolm Logan from Chiangmai (Thailand). He was interested to know make, year of make, type, and some indication of the value of the car in UK. Our Austin Seven expert John Caddy advises this is a cca 1929/30 Austin Seven Chummy. The apparent Crest above the windscreen is interesting. The King of Thailand had a Chummy, as did the Dali Lama. Book values in the UK on a 1929 Chummy are £2,500 average, £5,000 good, £7,000 excellent. Repatriation is uneconomical. One of a number of photos received from Peter Daws (UK) which we have been identifying. 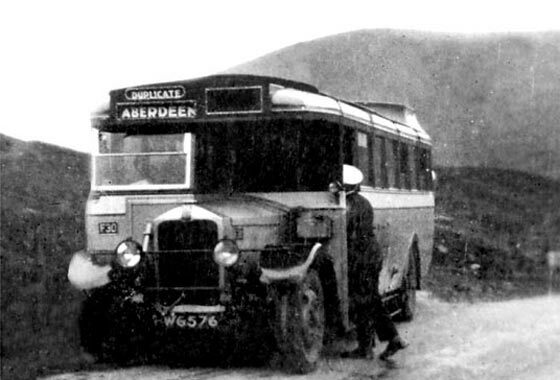 This one is a 1931 Albion Coach in the Scottish Highlands. Registration WG 575 was issued by Stirling County Council in mid 1931. A very similar bus reg WG 1448 still exists, which would have been registered at the end of 1932. This is a Model PW 65, Alexander body, originally purchased by W. Alexander & Sons, their F55. The one in the picture has the tag F30 so it was probably part of the same fleet. Photo received from Stian Skarestad Sjåvik (Norway). The picture is of a grandfather of a friend of his posing with his new car. The photo was taken in Norway (probably between 1935 and 1945). His friend is making a scrapbook containing old family photos and would very much like to add what kind of car his grandparents had. It was the family's first car. 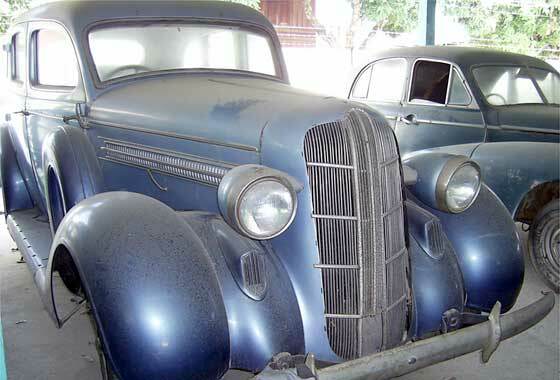 We can advise that this is a 1936 Dodge Four Door Sedan, and is very similar to the Dodge enquiry from Thailand shown lower down. Photo received from Malcolm Logan from Chiangmai (Thailand) of a car available for sale locally. It was advertised as a 1935 Dodge and he requested confirmation and value. The distinctive rad says this is a 1936 Dodge model. Buyer wants some 1.3m Baht (£18,000). UK values £2,000/£4,000/£8,000. US values excellent at about $14 -16,000. Adding a modern engine would wipe the value. Looks a recent respray possibly hiding unknown problems. Outer section of the grille is missing. IDENTIFICATION AND DATING: We Need Help ! Photo received from Chris Strohmeyer in Northern California (USA) of a fiberglass special with a 1940 Ford chassis and flathead V-8 engine. He needs desperately to identify the vehicle in the photo. Can we help? At this stage we regret that we cannot. This is not in our period nor strictly within our sphere of interest. Notwithstanding, we are pleased to post the picture in the hope that somebody knows something. Sadly we have lost the link to a US website which specialised in just fiberglass specials. Photos received from Michael Richards of the Pembrokeshire Motor Museum (UK) advising they have a 1939 Dennis New World they are restoring and need pictures and info to get it right. I saw a New Wold in Brighton on the 2006 Historic Commercial London to Brighton Run ( www.svvs.org/gallery-bricomms6.shtml ). Organisers of the run were HCVS ( http://www.hcvs.co.uk ) and they may be able to put them in touch. Programme said owned by: Horsham Veteran Fire Engine Pr. Gr. 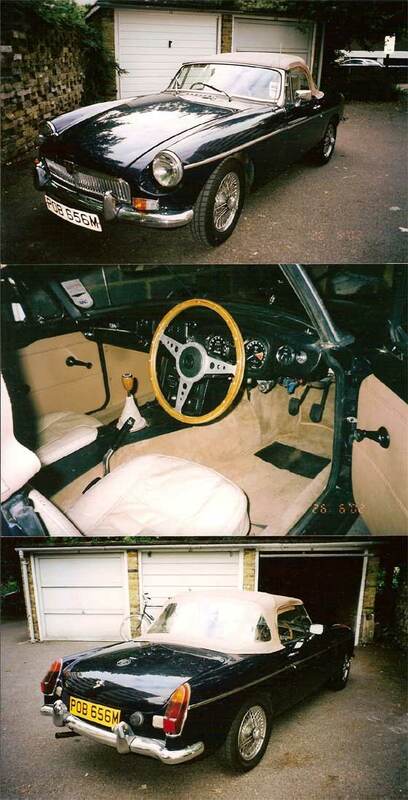 Information received from SVVS Member Stuart Owen (Italy) that his son's 1973 MG B Roadster was stolen in Wandsworth, London on 13/14 September 2006. Registered POB 656M with VIN GHN532785G, Engine N° BHM1111E 204057 (Lead Free C/H), and is fitted with overdive. The car had a bare metal respray in Midnight Blue and has a beige soft top, chrome bumpers, grille and wire wheels. The interior is beige with cream leather seats, wood rim s/wheel and a crackle-black instrument panel. 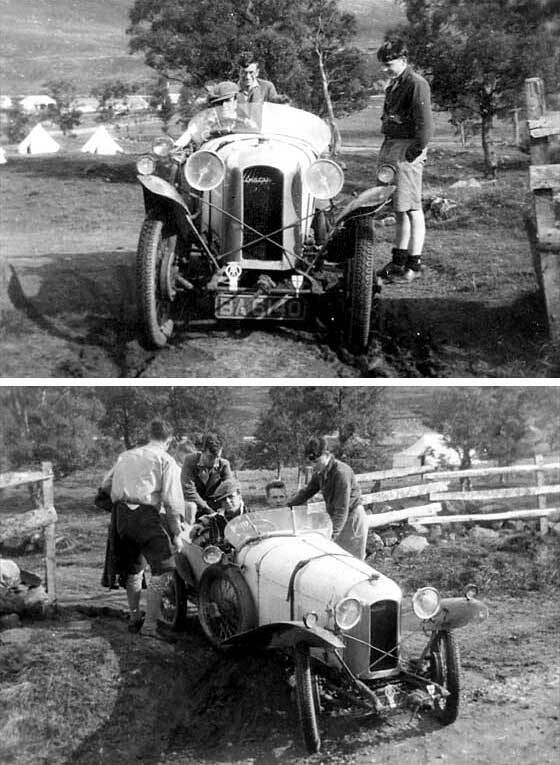 Photo received from John Bakke (Norway) of his grandfathers first car. 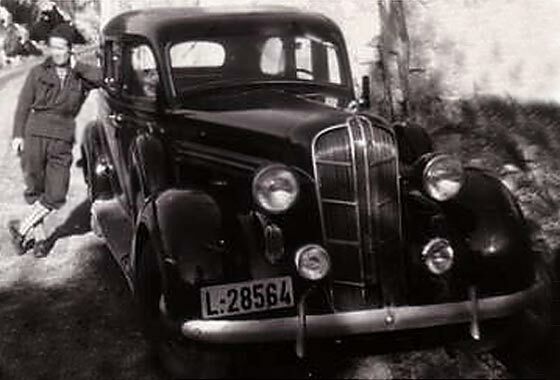 Father claims that it was an Adler or Adlerwerke, but he couldn't find any pictures to confirm. Neither could we. The picture is very small and unclear so we requested enlargement but got no further reply. All our experts say it is a 'German' looking car. We tried Adler Clubs but got no answer. 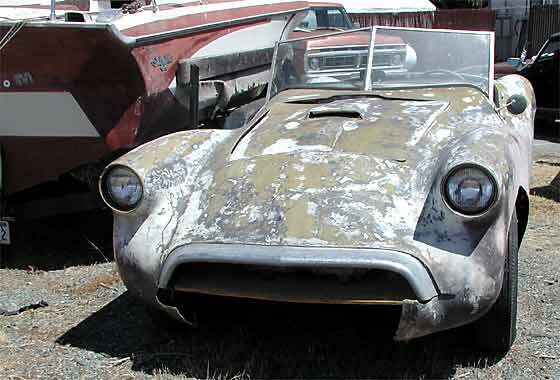 Possibly an Opel, even a Laubfrosch. Other suggestions an Austro Daimler, Seyer or Puch. American cyclecar or even a Panhard.